Shot into orbit Saturday by a gleaming white and gold Atlas 5 rocket, the U.S. Air Force's second top secret X-37B space plane will push the boundaries of the craft's design and could stay in orbit longer than its predecessor, according to military officials. The military isn't divulging what the space plane carries, but it could be shepherding high-tech Air Force experiments, spy sensors and other research payloads. "This program provides a test capability that was difficult to achieve through other means, the ability to examine how highly complex technologies will perform in space before they are made operational," said Richard McKinney, deputy under secretary of the Air Force for space programs. "But right now our focus is on the X-37B itself, and this second flight is important to our further understanding of its capabilities." Saturday's launch began the second mission of the X-37B, and the Air Force plans to build upon almost eight months of flight experience with a nearly identical craft in 2010. Also called the Orbital Test Vehicle, the program is managed by the Air Force Rapid Capabilities Office, a division headquartered in the Pentagon. But the X-37's genesis is from NASA. 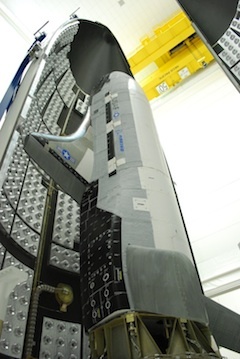 The space agency still provides engineering support for the space plane's thermal protection system. The spokesperson said early post-flight analysis of the first X-37B vehicle indicates it could have stayed in space beyond the craft's 270-day design life. That knowledge could compel managers to keep OTV 2 in orbit longer. "We brought back OTV 1 sooner than that to take advantage of an early launch opportunity for OTV 2," said Maj. Tracy Bunko, and Air Force spokesperson at the Pentagon. "However, the post-flight assessments on OTV 1 suggest that the vehicle could have actually gone beyond the 270-day designed on-orbit window. Subsequently, we may extend the flight duration of this mission to test the outside performance capabilities of the vehicle." The covert space plane blasted off inside the Atlas rocket's pointy 17-foot diameter nose cone at 5:46 p.m. EST (2246 GMT). 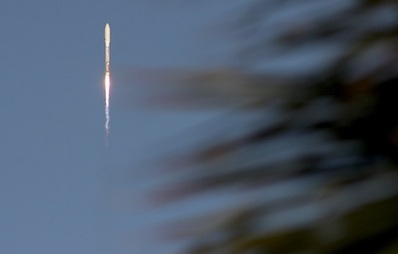 The 20-story rocket let out a deep rumble as it streaked away from Florida's Space Coast into a clear blue sky, disappearing from view about four minutes into flight. The Atlas first stage's Russian main engine accelerated the rocket to the edge of space in four-and-a-half minutes, before turning off and giving way to a hydrogen-fueled RL10 engine on the rocket's Centaur upper stage. 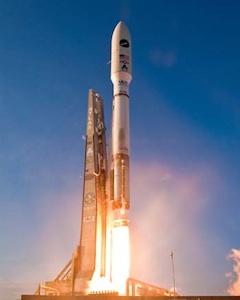 The military stopped releasing real-time updates on the mission when the upper stage engine shut down, but the Air Force and United Launch Alliance, the Atlas rocket's builder and operator, announced the flight was a success. "Launch is a very demanding business and having what appears to be a successful launch is always welcome news," McKinney said. "It is important to remember that this is an experimental vehicle; that this is just the second launch; and that we have just started what is a very systematic checkout of the system." Resembling a miniature space shuttle orbiter, the 29-foot-long stubby-winged ship is hauling classified cargo inside a payload bay no bigger than the bed of a pickup truck. After launch, the space plane is programmed to open its clamshell-like cargo bay doors and deploy a solar panel to charge its batteries. The X-37's cost and specific mission are top secret, but military officials proudly boast of the space plane's ability to return experiments from space. "It's a huge capability to allow us to do this, to test out materials and other objects in space and bring them back and take a look at them," McKinney said in a December press briefing. "Normally the objects either stay up there, they turn into space debris, or they burn upon reentry. So this allows us to check something out and bring it back." With a powerful main engine, a renewable energy source and electromechanical control surfaces, the 11,000-pound spacecraft can stay in orbit much longer than NASA's space shuttle orbiters. But its cargo capacity is just a fraction of the shuttle's lift ability, limiting the X-37's potential use in launching or retrieving satellites. But the X-37B could still test spy satellite technology and do other research. And its engine has enough thrust and fuel to chase down other satellites in orbit, yielding some analysts to predict the space plane could rendezvous with another spacecraft and take pictures of it. Seasoned satellite observers don't believe there was any such in-orbit rendezvous on the X-37's first mission, which spanned nearly eight months from launch through landing Dec. 3 at Vandenberg Air Force Base, Calif. The craft could also ferry into orbit materials science payloads, experimental reconnaissance sensors, innovative communications instruments, navigation technologies, or a variety of other potential cargo. "These are experiments of advanced technologies, so some program specifics are going to remain classified," Bunko said. Boeing's Phantom Works division built and tested two space-rated X-37B space planes at assembly facilities in southern California. The craft launched Friday is almost identical to the pioneer ship that flew last year, Air Force officials said. Engineers made a minor adjustment to the second OTV's landing gear tire pressure after a blowout during the first vehicle's return to Earth in December, according to Lt. Col. Troy Giese, the Air Force's X-37B program manager. Launching three months after the sister craft returned to Earth, the second X-37B space plane will continue flight research from the first mission, according to the Air Force. Artist's concept of the X-37B in orbit with the solar panel deployed. 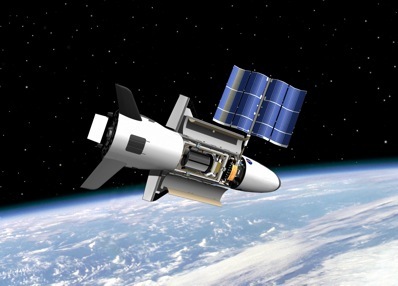 Credit: Boeing Co.
Military officials contended last year's mission was focused on proving the X-37 system would work. It was the first time the United States returned an unmanned vehicle to a landing on a runway, matching a feat achieved once by the Soviet Union with the Buran space shuttle. "It is important to remember that the X-37B itself is a new technology with state-of-the-art thermal protection systems and tiles, solar power systems, environmental modeling and, of course, its autonomous control and landing, and those are all being tested and evaluated in this program," Bunko said. But this flight will also conduct new tests. "Like all flight test programs, OTV 2 will build on the on-orbit demonstration of OTV 1, so we're expanding and fine tuning our test parameters," Bunko told Spaceflight Now. On this flight, officials plan to permit landing of the X-37 in higher winds. The space plane could also have more opportunities to return to the California landing site. "The post-flight assessment also showed potential for greater flexibility in the landing profile," Bunko said. "Based on the demonstrated ability of the electromechanical flight control and autonomous algorithms in OTV 1, the OTV 2 landing placards will be opened up to allow for greater landing opportunities during high winds or orbital cross range." "We look forward to testing enhancements to the landing profile," Giese said. Shielded by thermal blankets and ceramic tiles, the X-37 is designed to return to Earth on autopilot, line up with the runway at Vandenberg and glide to a pinpoint touchdown.